Here’s another subject we looked closely at when updating the guidebook for 2018: boating. 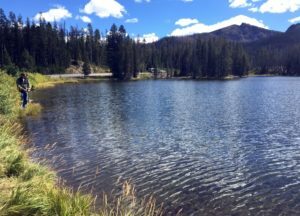 The National Park Service is now strictly enforcing the rules meant to keep aquatic invasive species out of Yellowstone waters. In the second printing of Yellowstone Treasures, Updated Fifth Edition, we’ve added discussion of the Watercraft Inspection Stations, where both motorized and nonmotorized boats are checked before they are allowed into Lewis and Yellowstone Lakes. According to the NPS article “Protecting the Greater Yellowstone Ecosystem from aquatic invasive species,” here are some of the species of most concern: zebra and quagga mussels, Asian clams, Asian carp species, Eurasian watermilfoil, hydrilla, flowering rush, whirling disease, and viral hemorrhagic septicemia. So the invaders can be animals, plants, or microbes. Invasive shellfish are particularly bad, because they can block pipes, eat up the phytoplankton, and cover docks and beaches. It is really effective for boat owners to just take three steps: drain, clean, and dry your equipment. See “Clean, Drain, and Dry” for an introduction to the rules and the Boating page on the official Yellowstone National Park website to find out where to get your boat inspected and get your permit. Seven-day permits are $10 for motorized, $5 for nonmotorized boats like angler float tubes, canoes, and kayaks. Stay informed with Yellowstone Treasures, both the book and this website. Have you ever imagined seeing the lakeside hot springs of West Thumb Geyser Basin from the water? A new article by Kurt Repanshek, “Fleeing Yellowstone & Grand Teton Crowds by Sea Kayak,” tells you how to go on a guided kayaking tour to do just that. 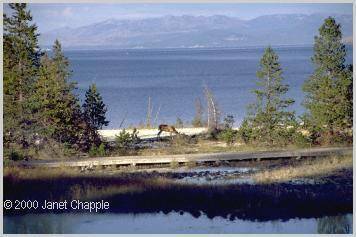 You can also bring your own boat and explore lakes beyond Yellowstone Lake. From the Travel Tips section of Yellowstone Treasures, here are some of the regulations about nonmotorized boating. It’s permitted on all park lakes EXCEPT Sylvan and Eleanor Lakes, Twin Lakes, or Beach Springs Lagoon. West Yellowstone Visitor Information Center. Boats are not allowed on rivers and streams, except that hand-propelled vessels may use the channel between Lewis and Shoshone Lakes. Only non-motorized boats are allowed in the most remote sections of the three so-called fingers of the lake: Flat Mountain Arm, South Arm, and Southeast Arm. This is primarily to protect the nesting pelicans, terns, and seagulls. Boating is a great way to see birds! Back in 1994 someone must have purposely and illegally stocked Yellowstone Lake with lake trout. 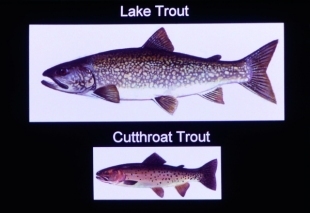 Before it could be proven that these non-native fish had spread throughout the lake, they began adversely affecting the much smaller native cutthroat trout. Many Yellowstone animals depend on the native fish as an important part of their diet but cannot catch the big lake trout. For example, grizzly bears and pelicans eat cutthroat from the lake, particularly in early summer. Now, with major help from sources such as the Yellowstone Foundation and the Wyoming Wildlife and Natural Resource Trust Board, more and more lake trout are being removed every year— up to 300,000 in 2013 alone. At the same time many more juvenile cutthroat trout are surviving than in the early years of this century. Meanwhile, anglers again this summer must kill all lake trout and either eat them or puncture the air bladder and dispose of the carcass in deep water. And cutthroat trout must be returned to the water immediately. See the book excerpt about fish and fishing if you’d like to know more about the subject. The March 2014 Sunset has a section called “The Ultimate Guide to the West’s Classic National Parks” and devotes four pages to Yellowstone, including an entertaining essay by novelist Nevada Barr and write-ups on five other popular parks. I learned that there are now 59 national parks, with 40 of them in western states. A sidebar quotes geyser guru T. Scott Bryan on why he (and I!) love geysers. Just a couple of items of advice to visitors could be improved upon. To “ogle bears,” both black and grizzly, I would not suggest the Lamar Valley but more likely the Tower-Roosevelt area or even around Canyon or Mammoth. “About 100 gray wolves. . . can be spotted near the Blacktail Plateau” is misleading; best chances for viewing wolves have usually been some 20 or 25 miles east of there on the Northeast Entrance road; second best may be in Hayden Valley—but, then, you really never know where wolves or bears are going to be. About boating on Yellowstone Lake, the suggestion to “rent a boat and paddle out onto the blue waters” is tempting, but they need just a few words of warning about the very common afternoon storms or perhaps even a mention that at least 40 people have drowned in the lake, many in small boats.